About Us - ZETO Software Sp. z o.o. ZETO Software is an interesting combination of 45 years of market tradition with young, ambitious staff and the need for continuous development. In the 70s of the twentieth century one of the IT pioneers in Poland. Thanks to the consistently implemented concept of competence development and products on the current software market. We have unquestionable competence in the fields of agriculture, public administration and energy. Our capital is undoubtedly a strong brand. For 45 years we care about its attractiveness and we try to guarantee the quality of our services. Another advantage of the company is the competent and creative team. At present, the potential of ZETO Software is provided by more than 140 specialists who are free to move in a wide range of IT technologies. Providing advanced IT services requires not only technological competence but also a high organizational culture. 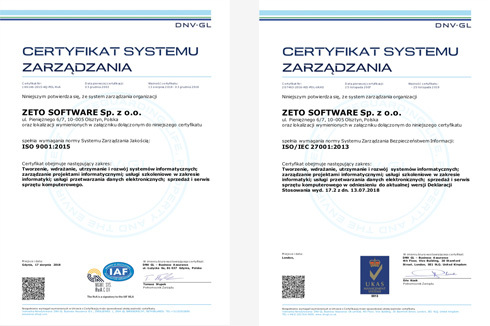 ZETO Software works to provide our customers with high quality and security processes related to the creation, deployment and maintenance of IT systems and data processing. For more than 10 years, we have been relying on ISO 9001 and ISO 27001 management systems.